Wesley Monumental is known throughout the city for its tradition of beautiful, sacred music. Come worship God with us by singing in the Chancel Choir or by playing handbells. Admission to either choir is at the discretion of the director. Singing a wide variety of music from early plainsong to traditional and contemporary classics, our principal choir sings at the 11:00 Sunday morning service (both services on Easter), as well as Ash Wednesday, Maundy Thursday, Christmas Eve Candlelight Service, and other special occasions as needed. All members of the 55-voice choir are music readers, and several have advanced degrees in music. In addition to singing in worship, they regularly perform major choral works with orchestra. Most recently, they performed Bach’s magnum opus, the Mass in B Minor, with 21-piece orchestra to celebrate Wesley’s 150th anniversary. 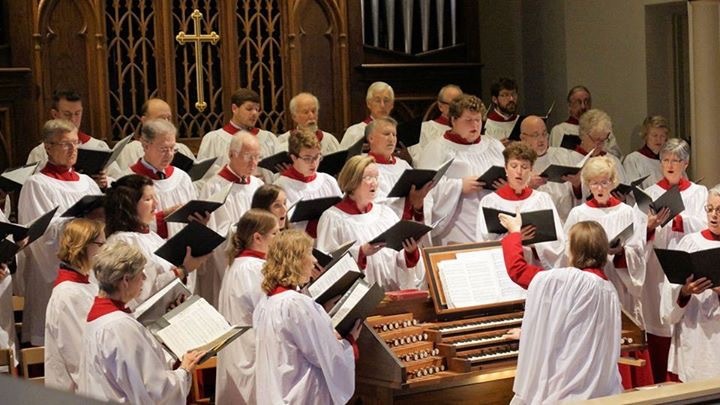 In recent years the Chancel Choir has toured England, Scotland, Austria, and the Czech Republic, and was featured in two episodes of the BBC’s weekly television series, “Songs of Praise,” in commemoration of the 300th anniversary of Charles Wesley’s birth. They have also sung noon prayer at Notre Dame Cathedral in Paris, Cologne Cathedral in Germany, and Bach’s Church in Leipzig, the Thomaskirche. Rehearsal: Wednesday, 7:15 – 9:00 PM, Choir Room, 4th floor. Under the direction of Raymond Patricio and performing on a five-octave set of Malmark Handbells, the choir performs simple to moderately difficult music for worship and other special occasions. For more information and for rehearsal times, contact the church office to obtain Raymond Patricio’s information.